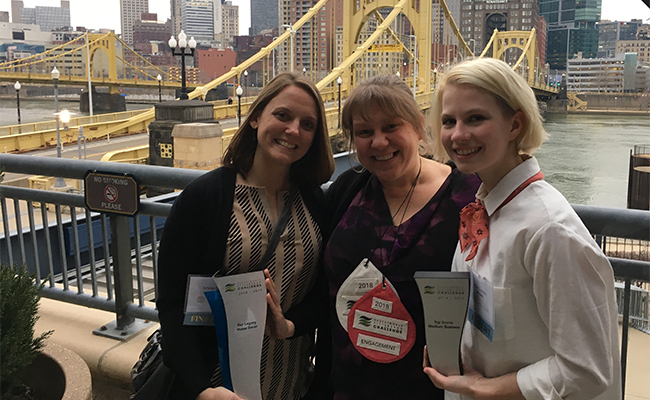 Tetra Tech was among the top winners honored at the Sustainable Pittsburgh Challenge (SPC) Finale and Awards Ceremony on March 21, 2019. The purpose of SPC is to increase sustainability practices by Pittsburgh businesses across seven major categories: social equity, energy, water, materials management, transportation, air quality, and engagement. More than 100 employers in the Pittsburgh, Pennsylvania, region participated in the challenge and were evaluated on 2,209 sustainability actions over a 13-month period that began in January 2018. Tetra Tech received first place in the Medium Business category and recognition as the Top Legacy Water Saver in 2018. “It has been such a joy to witness our office cooperate to participate in this program and improve our sustainability,” said Amber Kelley, support services manager of Tetra Tech’s Pittsburgh office. The office reached their sustainability goals for this challenge in various ways. They created a compost program where compost pails were placed in the kitchen, and some team members took the compost home for their gardens. Team members held fundraisers, participated in food and clothing drives, and volunteered for various community initiatives. The office also supported Habitat for Humanity, Children’s Hospital of Pittsburgh Foundation, Aluminum Cans for Burned Children, and Men’s Warehouse Suit Drive. Tetra Tech employees received ribbons at the awards celebration in recognition of their participation in office sustainability meetings, trainings, and other engagement activities in 2018. More than 300 Pittsburgh businesses have participated in the challenge since 2011. Each year the SPC participants implement innovative strategies to achieve sustainability. We look forward to continuing our sustainability efforts in the Pittsburgh region for years to come. Learn more about Tetra Tech’s company-wide sustainability practices.